A lovely and spacious (1956 Sq. Ft) single level villa. 4 bedrooms and 3 bathrooms with new carpets. 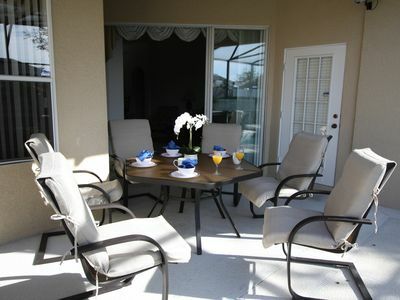 Located in the quiet, prestigious secure gated community of Calabay Parc at Tower Lake. The villa is bright and airy, has two master suites containing king size beds and en-suites, both with direct access to the pool deck. The pool area has an informal breakfast table, there are 6 pool chairs and 4 sun loungers to make the most of the private, secluded, south facing pool. 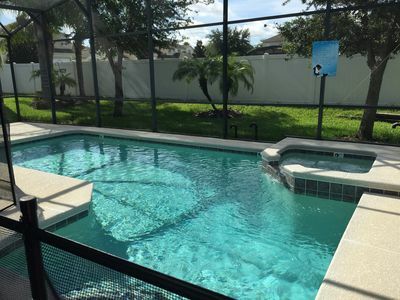 The pool, spa and patio are enclosed by a Lanai (insect screen) and during the winter months the water can be heated at extra cost. There are two twin bedded rooms which share a family bathroom. All bedrooms contain ample storage space and new flat screen TV’s with cable. Additionally, the twin rooms have DVD players. These rooms are at the front of the house, making them more secure against children getting into the pool area unsupervised, they can be further secured with a child gate if required. 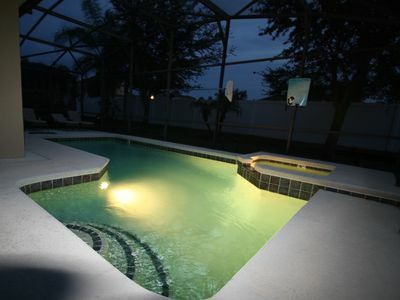 There is also a removable “Kiddie Catcher” around the pool for added peace of mind. The hub of the property is the central, fully equipped kitchen with a four ring grill, oven, large fridge/freezer, microwave, dishwasher and twin sinks with garbage disposal. A toaster and coffee maker is also provided for your use. There are bar stools at the kitchen counter. A formal dining area with table and chairs lies adjacent to the kitchen itself. There is a snug area with a comfortable bed settee, large screen TV and PS3 games console separated from the main living area, there are also headphones provided so the noise from the games area does not invade the main living area, which itself has luxurious sofas with coffee tables and lamps. An iPod dock, DVD player and 40” LED TV with cable channels is provided for your entertainment pleasure. 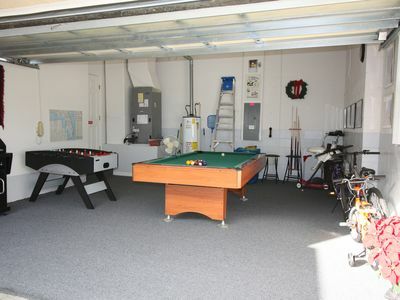 The garage has a fan for warm days and is converted to a game room with a pool table and foosball. 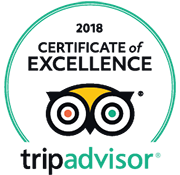 There are bicycles and fishing equipment for your use, a brand new gas grille is available on request, for al fresco eating around the pool and also a high chair, buggy and stroller. A full size crib can be supplied if required. 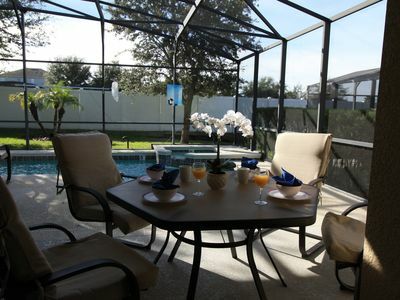 The villa is in an excellent location standing just a minutes stroll from Tower Lake which has excellent bass fishing and a small boat jetty, from which you can enjoy the lovely Florida sunsets. For golfers the marvellous Southern Dunes public golf course is a two minute drive away, the Ridgewood Lakes course is also very close by, with Champions Gate and Highlands Reserve a few minutes drive beyond. A huge Walmart Supercentre and Loews are literally walking distance. Restaurants including the highly regarded Manny’s Chop House are close by. Fast food outlets such as Dairy Queen, McDonalds, KFC, plus Walgreens, Winn Dixie and Publix Supermarket are all within a few minutes drive. Posner Park Shopping Centre and the I4 are realistically a maximum of 10 minutes away. From there it is only another 10 minutes to the start of the Disney Exits or 20 minutes into Orlando itself, with all its attractions such as Seaworld, Universal Studios and International Drive. The international airport is about 35 minutes way in total. LEGOLAND is an easy 20 minute drive. Daytona Beach and the Gulf coast are just over an hours drive, as is Tampa, Clearwater and St Petes Beach. It is also possible to reach the Everglades in 3-4 hours.